Now that you have a first Data Model and Project in place, you can go to 'Data' and start entering data. 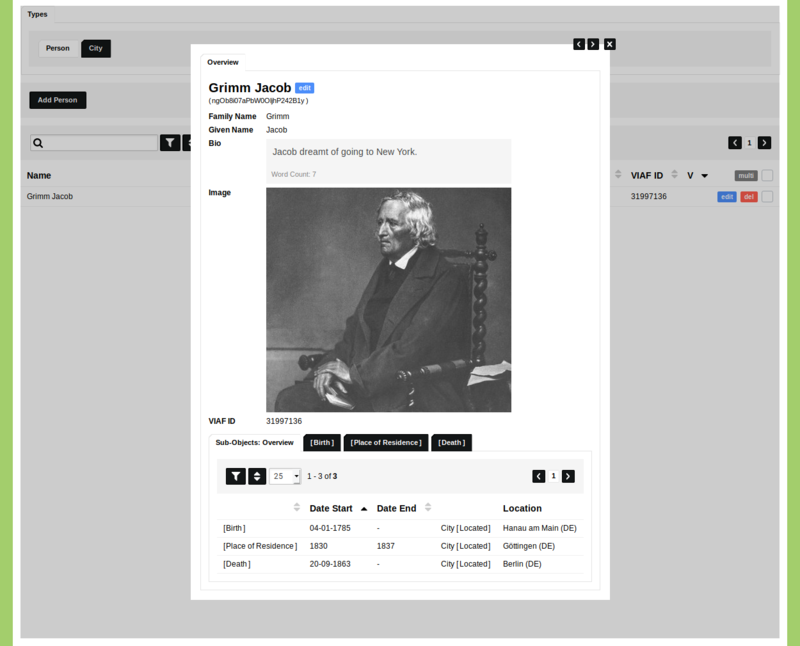 Click on your Type 'Person' and click on 'Add Person' to add your first Object. Enter a 'Family Name', a 'Given Name', a 'Bio', select an 'Image' from file or a URL, and enter 'VIAF id' (you can find a VIAF id at viaf.org). In the Sub-Object Editor you can click on the '+' button next to the name of each Sub-Object to open the selected Sub-Object. The 'Birth' and 'Death' Sub-Objects only have a single '+' button because these Sub-Objects have been configured as unique Sub-Objects. The 'Place of Residence' Sub-Object has a single and a double '+' sign as it was not set to unique. Click on the single '+' sign for each Sub-Object and enter a date for the birth and death and enter a period for the place of residence. Specify a Location Reference for each Sub-Object by finding an Object of a City. Start to type in the input field with the magnifying glass and click on one of the cities that appears. Once you are finished entering your data, click 'Save Person'. Click 'Cancel' to close the Person input fields or start entering your second Object in the emptied input fields. Tip: to quickly save an Object press the 'Enter' or 'Return' key and continue entering a next Object in the emptied fields. To edit this Object, either click the blue 'edit' button in view mode, or click the blue 'edit' button in the overview of Objects. Click the icon to visualise this Object geographically. The Geographic Visualisation is covered in the Guide Run the Geographic Visualisation.